From Leading Stair Parts Suppliers. Canadian Wide Shipping & Beyond! Great Discount Prices 20-35% Off! stair treads, iron balusters, hand railings, box newel post, extra thick treads, etc. educated caring people. We truly care about exceeding your expectations. ship our wood stairs & railings NA wide. affordable prices to all consumers". 3,000+ wood stair orders in the last five years, you can buy from us with confidence. We ship stair parts to all Atlantic Provinces & Canada Wide. Prefinished Stair Parts in clear coat and stain finish. Custom stain match hardwood stairs & rails to your flooring sample, MinWax� stain, or clear coat. Specializing in existing rail & staircase renovations and new home stairs in Nova Scotia. Renovators / installers of stairs and railings in Greater Halifax ( HRM ), Valley, South Shore. With all the different staircase components & terminology for wood stairs, it can get confusing. Get detailed stair definitions here. Real Customer Reviews. We love it when our customers speak for us! Here's a sample: "The solid oak stair treads are..."
We Are Trusted Suppliers For Quality Wood Stairs & Railings And Have Over 3,000 Stair Parts Sales In The Last Five Years Alone. You Can Buy Your Wood Stairs Direct In Canada At Cheap Discount Prices & GET GREAT QUALITY! Staircase Parts Like: Stair Treads, Metal Spindles, Stair Railings, Box Newel Post, Extra Thick Treads & More. Unfinished & Prefinished Wood Stairs For Private Home Owners, Contractors, Developers & Supply Stores. Our Main Focus Is Being Stair Parts Suppliers & Manufacturers Offering Canada Wide Direct Shipping At Discount Prices For You! 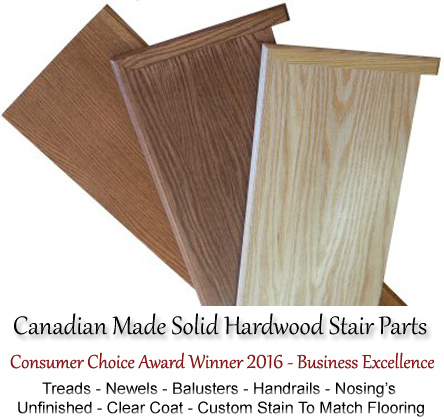 Buy Wood Stairs Supplies Direct: We are Canada's largest retail stair parts suppliers! We offer the following 3 key factors in ever sale we have ever done: great discounts, great customer service, and great products. We also have custom spray booth shop, so we can offer pre-finished stair parts. Do Not Settle For Less: Why would you pay top dollar for lower quality China made stair parts from big building supply stores like: ACE LumberMart©, Castle Building Centres©, Home Depot©, Home Hardware©, Kent Building Supplies©, Lowe's Canada©, Rona©, Timber Mart©, Etc. In-Sock Wood Types: yellow birch, red oak, hard maple and pre-finished white. Special Order Wood Types: american cherry, ash, jatoba / brazilian cherry, hickory, knotty pine, mahogany, walnut, white oak. Knotty Pine Price Note: We offer almost all of the items listed on our web site in knotty pine softwood. For customers looking to buy from Wood Stairs Canada, we simply sell "almost all" our knotty pine stair parts at the exact same prices listed for our oak stair parts on our web site ( so use the listed oak product pricing to get your knotty pine product costing ). Notable Products Are: full false stair treads, metal balusters ( both round and square shaft ), good both face extra thick treads, hardwood box newels, full square balusters, pre-finished white balusters, stair nosing up to 12 feet long, handrail up to 16 feet long, spray booth pre-finished stair parts ( clear coat or custom stained or MinWax Oil Based Stain Color ). Wood Stairs Canada © Are Retail Suppliers & Manufacturers Of Quality Hardwood Stairs. It's our word that you can count on great product, great prices and great service. Wood Stairs Canada © mission is very simple: 'to provide high quality stair parts at an affordable price to all consumers'. We stock many types of stair railings & stair parts: wood stair treads, hardwood balusters, newel post and hand railings. Custom wood millwork and stair parts and stair treads & components in many wood types: ash, birch, cherry, jatoba, maple, hickory, knotty pine, mahogany, oak, walnut, white. We are offer stair treads that are: oversized extra wide or extra thick, false stair treads, pie shaped treads for curve staircases & winder sets ( also bamboo stair treads & bamboo stair parts on special order ). We also have our very own in-house custom millwork shop, so feel free to send us your "not so normal request". Are you a Home Owner, Wholesaler, Distributor, Contractor, Developer or a Retailer that owns a Hardware Store? 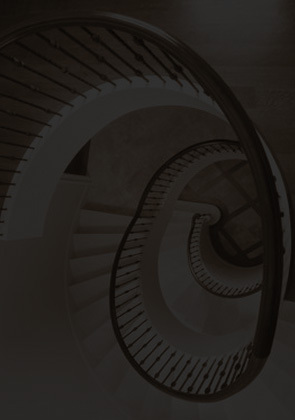 If you answered yes, let us take care of your hardwood stairs supply needs. Please Do Contact Us Today For Your Discount Rates! We Also Ship Stair Parts To The Following Areas: Aruba, Bahamas, Bermuda, Dominican Republic Central, South, and East, Dominican Republic North Coast, Grand Cayman ( Cayman Islands ), Jamaica, Mexico ( Acapulco, Cabo San Lucas, Cancun, Cozumel, Ixtapa, Manzanillo, Mazatlan, Puerto Vallarta ), St. Kitts-Nevis, St. Maarten, Turks & Caicos, USVI St. Croix, USVI St. Thomas, Saint-Pierre ( Miquelon ) & More. All Material Is © Copyright - Your Source For Hardwood Stair Parts, Stair Treads, Balusters & Railings In Canada / USA.